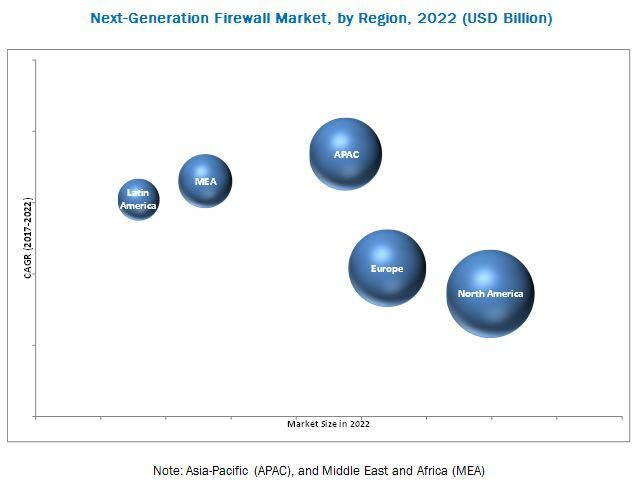 [136 Pages Report] The overall Next-Generation Firewall market is expected to grow from USD 2.39 billion in 2017 to USD 4.27 billion by 2023, at a CAGR of 12.3% from 2017 to 2022. NGFW is a process of collecting, archiving, managing, and reporting the logs, which are generated from various devices, such as firewalls, routers, servers, and switches. NGFW solutions deal with a huge amount of computer-generated log data. The main objective is to track the security events and network activities. With proper NGFW solutions, an organization can effectively manage logs while ensuring the integrity and improved business continuity. The sophistication level in the cyberattacks is increasing and creating demands for more comprehensive NGFW services that would enable the protection of complex network infrastructure. The base year considered for the study is 2017, and the forecast has been provided for the period between 2017 and 2022. Low level of awereness about advanced cyber threats. As the world is becoming connected, the trend of IoT is also increasing. This has given the awareness and need to protect the network infrastructure. More devices are getting connected to the internet, including the TVs, mobile devices, and printers. According to a study conducted by Cisco, it has been stated that more than 15 billion devices are connected to the internet and are expected to grow to 500 billion by 2030. Many small organizations use such equipment in their premises to make their business processes more convenient. With the increase in the number of devices, a variety of cyber-attacks are also getting added to the threat landscape. For instance, on October 21st, 2016, a series of DDoS attacks affected the internet activities in the US. The attack was specifically targeted at the Domain Name System (DNS), which affected all the activities associated with the online transactions, including online shopping and social media interactions. Moreover, a recent survey from ESET stated that more than 40% of the Americans are not sure if their IoT devices are safe and secure from advanced cyber-attacks. Therefore, most of the SMEs are deploying advanced security solutions, such as NGFW and UTM for securing their business infrastructure; all such factors are driving the demand for the Next-Generation Firewall market. Security vendors such as Fortinet, SonicWall, Zscaler, and Palo Alto Networks offer solutions for any size of organization. During this research study, major players operating in the NGFW market in various regions have been identified, and their offerings, regional presence, and distribution channels have been analyzed through in-depth discussions. Top-down and bottom-up approaches have been used to determine the overall market size. Sizes of the other individual markets have been estimated using the percentage splits obtained through secondary sources such as Hoovers, Bloomberg BusinessWeek, and Factiva, along with primary respondents. The entire procedure includes the study of the annual and financial reports of the top market players and extensive interviews with industry experts such as CEOs, VPs, directors, and marketing executives for key insights (both qualitative and quantitative) pertaining to the market. The figure below shows the breakdown of the primaries on the basis of the company type, designation, and region considered during the research study. 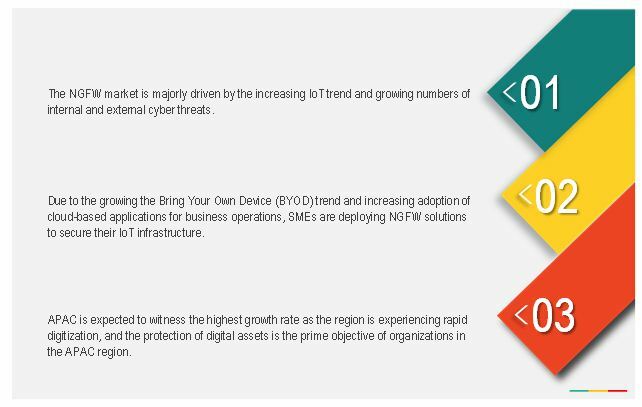 The NGFW market comprises a cybersecurity solution vendors involved in the research and product development; firewall providers; managed security service provides; and post-sales services providers. Key players considered in the analysis of the market are Cisco Systems (California, US), Fortinet, Inc. (California, US), Check Point Software (California, US), Palo Alto Networks (California, US), Barracuda Networks (California, US), Forcepoint (Texas, US), Zscaler (California, US), Juniper Networks (California, US), WatchGuard Technologies (California, US), and Sophos Ltd. (Abingdon, UK). In February 2017, Cisco launched Cisco Firepower 2100 Series Next-Generation Firewall which provides threat defense and protects the critical data of banks and retail sector which have a huge volumes of business data. In February 2017, Palo Alto Networks launched a new availability in NGFW offerings with new hardware and virtual appliances. This will enable the customers to deploy these solutions from cloud and secure their data from various attacks and vulnerabilities. The company has launched these enhancements in New PA-5200 Series, New PA-800 Series, New PA-220 and VM-Series virtual firewall models of their NGFW products. In February 2017, Fortinet launched a new NGFW solution in its product portfolio named FortiGate 3980E and FortiGate 7060E. These appliances are chassis-based enterprise firewalls and provide highest performance by providing enhanced security. Detailed analysis and profiling along with vendor DIVE matrix to get detailed information regarding their competitors on the basis of their product offerings and business strategies. The report reviews the major players who offer services. Additionally, the report will outline the findings and analysis on how well each vendor performs within MarketsandMarkets criteria. The overall Next-Generation Firewall market is expected to grow from USD 2.39 billion in 2017 to USD 4.27 billion by 2022, at a Compound Annual Growth Rate (CAGR) of 12.3%. Increasing IoT trend and increasing internal and external threats are the key factors driving the growth of this market. Next-generation firewall is a process of collecting, archiving, managing, and reporting the logs, which are generated from various devices, such as firewalls, routers, servers, and switches. NGFW solutions deal with a huge amount of computer-generated log data. The main objective is to track the security events and network activities. With proper NGFW solutions, an organization can effectively manage logs while ensuring the integrity and improved business continuity. The market has been segmented, on the basis of solution, into hardware, virtual and cloud-based. The market for cloud-based solutions is expected to grow at the highest CAGR between 2017 and 2022. The market for cloud-based solutions is growing as more and more companies are adopting NGFW solutions and services to secure their business infrastructure from advanced threats such as, ransomware, APTs, zero day attacks, malware, and unauthorized accesses. SMEs segment is expected to grow at the highest CAGR during the forecast period, owing to the increasing incidences of cyber-attacks on these enterprises as well as to deploy advanced security solutions by eliminating the traditional ones. However, the large enterprise's segment accounts for the largest share of the Next-Generation Firewall market in 2017. NGFW solutions and services have been deployed across various industry verticals, including Banking Financial Services, and Insurance (BFSI); education; energy and utilities; government and public utilities; healthcare; IT and telecom; manufacturing; retail, and others. The BFSI vertical is expected to grow at the highest CAGR during the forecast period. However, the government and public utilities vertical is estimated to have the largest market size in 2017. The global market has been segmented on the basis of regions into North America, Europe, Asia Pacific (APAC), Middle East and Africa (MEA), and Latin America to provide a region-specific analysis in the report. The North American region, followed by Europe, is expected to become the largest revenue-generating region for NGFW service vendors in 2017. This is mainly due to the developed economies of the US and Canada, there is a high focus on innovations obtained from R&D and security technologies. The APAC region is expected to be the fastest-growing region in the market. The growth in this region is primarily driven by the increasing adoption of IoT devices and BYOD technologies within organizations. Organizations in the BFSI vertical need security products and services that can protect employees, customers, assets, offices, branches, and operations. New and improved financial products and services are frequently introduced by organizations to enhance business operations and expand customer base, making the industry a lucrative target for fraudsters. With facilities such as smart banking, internet banking, and mobile banking, BFSI companies need to prioritize NGFW security solutions. Attacks such as DDoS, ransomware, advanced APTs, and other sophisticated attacks have been experienced in the BFSI vertical. To meet the evolving security demands of the BFSI vertical, network security industry players are coming up with innovative solutions to replace traditional solutions and provide additional features. The implementation of eGovernance by the government agencies in several countries across the globe has led to an increased adoption of NGFW solutions in the government and defense segment. Government and public utilities agencies handle highly-secure and private data of individuals, departments, processes, and agencies. A large chunk of the content generated in this sector is undisclosed and highly classified. Government agencies are subject to stringent security policies and regulations, owing to the critical nature of the data. Thus, the deployment of NGFW solutions and services can minimize the risks associated with potential attacks on the government and public utilities vertical. The IT and telecommunications vertical includes IT solutions and services providers, consulting companies, Internet Service Providers (ISPs), and communication companies. The companies in this industry are constantly evolving in terms of technology. The vertical is also an early adopter of innovative technological solutions. The IT and telecommunications companies are deploying large numbers of services through the web and mobile applications. Thus, major network security solutions providers are focusing on offering NGFW security solutions for IT and telecommunications companies. These solutions help organizations to align business strategies with email security plans and create awareness programs for employees and customers. What are the new opportunities which the NGFW vendors are exploring? Who are the key players in the market and how intense is the competition? Key players in the Next-Generation Firewall market include Cisco Systems (California, US), Fortinet, Inc. (California, US), Check Point Software (California, US), Palo Alto Networks (California, US), Barracuda Networks (California, US), Forcepoint (Texas, US), Zscaler (California, US), Juniper Networks (California, US), WatchGuard Technologies (California, US), and Sophos Ltd. (Abingdon, UK). These players are increasingly undertaking mergers and acquisitions, and product launches to develop and introduce new technologies and products in the market. 5.1.3 Check Point Software Technologies Ltd.
11.3 Palo Alto Networks, Inc.